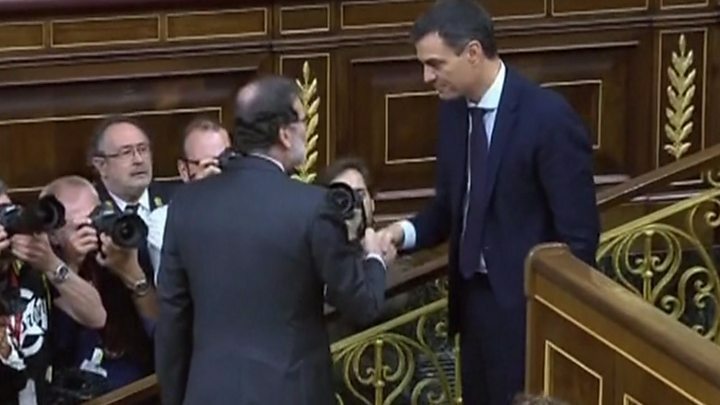 Media captionThe BBC's Gavin Lee said Mariano Rajoy's departure followed a "political earthquake"
During the second day of debate on Friday, Mr Rajoy admitted facing defeat and told MPs that it has been "an honour to leave a better Spain than I found". Mr Sánchez secured a majority in the vote after gaining support from various smaller parties, including the Basque Nationalist Party - 180 MPs backed the motion, 169 voted against, with one abstention. Mr Sánchez says Mr Rajoy, 63, had failed to take responsibility for his party's involvement in the scandal, which hit the headlines again last week after one of its former treasurers was given a 33-year jail sentence. Mariano Rajoy walked out of Congress and out of a job this afternoon. With a fixed smile, he hugged his staff who cheered and lined the way to the last ride in his parliamentary car. Cheers turned to boos outside the parliament's gates, with hundreds of protesters screaming "Good riddance", and placards which read "PP - Corrupting Spain since 1990". The party was explicitly linked to what the judge called "institutionalised corruption" and questioned the court testimony of the now-former PM. Mr Rajoy, the seemingly bulletproof leader who had long resisted calls for his resignation and who survived a previous no-confidence vote, has gone. His successor, Pedro Sánchez, nicknamed "Mr Handsome", now has several expectant parties with conflicting interests to see to, for agreeing to oust Mr Rajoy. It's been dubbed the "Frankenstein coalition" because while many are optimistic for a new kind of politics without corruption, some critics say he may instead have created a political monster. Months later he confounded his many critics by returning to win the Socialist primary. Spain's constitution states that the party presenting a no-confidence motion must be prepared to govern and replace the deposed prime minister if a parliamentary majority backs it. Therefore this moderate but ambitious 46-year-old from Madrid is set to be Spain's new prime minister, despite the fact that his party commands less than a quarter of seats in Congress. Mr Rajoy's departure casts the EU's fifth-largest economy into political uncertainty. Mr Sánchez is expected to be sworn in at the weekend and to name a cabinet next week. Although he leads the Socialist PSOE party, he is not a member of parliament. Correspondents say that with only 84 lower house seats, the party will struggle to find allies to get legislation enacted. Mr Sánchez is expected to get support from Podemos. Smaller groups - including Basque and Catalan nationalists - supported the no-confidence motion, but it is unclear whether they will back the new government.